All Y'all Need has their monthly link up posted. 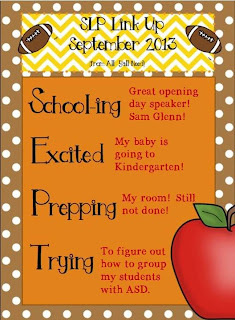 This month, they are asking about: school, excited for, prepping, and trying. I love joining these linky parties and seeing what other people are doing and excited about. I feel like it gives me a little glimpse into their world. Below is what I am up to this month. Remember to go to All Y'all Need and click the links to the other bloggers who have participated to get a little glimpse into their worlds too! School-ing: For the last three years, my district has recruited amazing speakers for our opening day meeting. This year, Sam Glenn presented to us about attitude. He was an amazing and funny speaker who really got us in a great state of mind to start the school year. Excited: My baby is going to Kindergarten. I will have a first grader and a Kindergartener. I can't even believe how fast they have both grown! So excited for both of them! Prepping: My room. I am still not even close to done with decorating. I have everything ready to go, but haven't put it up yet. I also just inherited a bulletin board outside of my room that I have never been able to decorate before. I am trying to think of ideas of what to do with my awesome new space! I have packets created for students who turn in their summer packets, so at least those are ready to go! Trying: I have three self-contained rooms with students with ASD this year. I am trying to figure out how to best service my new crew of kids. I am thinking that there is going to be a lot of push-in, and also social language groups with our school social worker. I am truly looking forward to a great year! I hope you have a great start to your year too! Remember to check back at All Y'all Need to see what other fabulous bloggers are up to! A couple of the school systems I worked in (1 in Ga., 1 in SC) used to have system-wide meetings at the beginning of the school year, and would have a guest speaker. 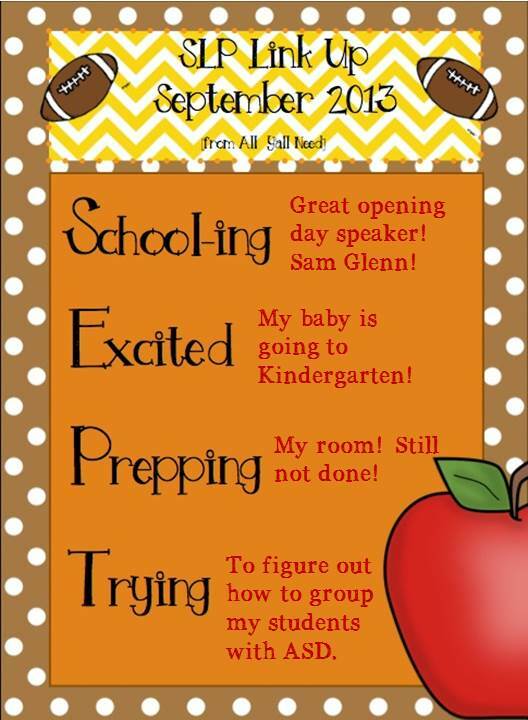 Perfect way to get excited about the new school year! Sounds like your year is starting off with a bang! Looking forward to hearing about how you address social language. Thanks for linking up! I'm glad I'm not the only one who is still decorating! We had our professional development last week, and kids started Tuesday so I'm still working on my room and scheduling. Reading about everyone who has already started therapy is making me feel very far behind! lol! We don't have a specials schedule yet- not until Monday, so I can't even start to schedule yet! I feel super far behind too!